I want to point another difference from page 1 from the issue versus the collected edition. 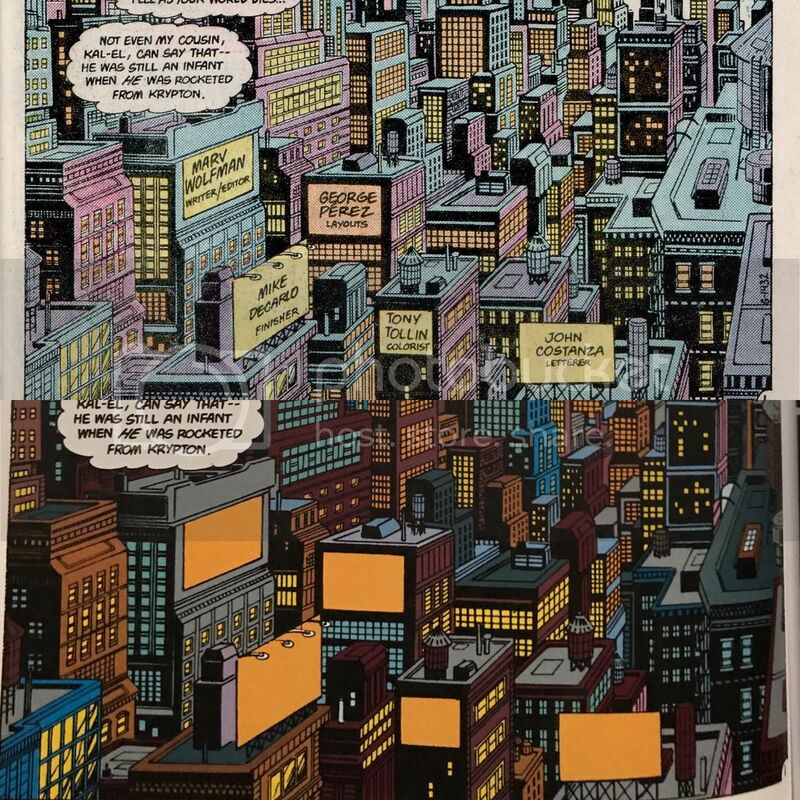 You mentioned that the two spelling errors were corrected, but I miss seeing the credit boxes as they originally appeared on billboards on the buildings in the comic versus them being blanked out in later reprints. Just another reason why I generally prefer issues over trades. That's awful, @Pants. Had no idea. Another Crisis Tapes?! Wahoo!! In honor of, and to participate in these episodes, I bought the full run of Crisis at Wild Pig Comics (RIP) several years ago...and now I can read issue #4!! 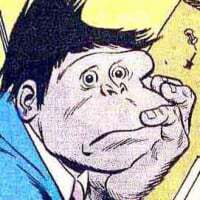 Re: the footnotes to “see this issue”, Crisis crossovers were completely optional, left up to the respective creative teams as to whether they would cooperate or not. While Marv was hoping everyone would jump on board and participate, initially no one was interested in doing so. Eventually most of the other creators decided to play along, but that's why it took so long for other “see this issue” footnotes to show up. As for Lady Quark, the real answer as to her creation was simply that Marv wanted to create a new character for the new universe that was to come out of Crisis. He created Kole specifically to die in Crisis, and Lady Quark to live after Crisis. That’s the only real reason for her relatively elaborate set-up. The problem was no one picked up the ball (Lady Quark) and ran with it post-Crisis. As for Dr. Light, Marv said in a 1983 interview (Comics Journal #80) that he was thinking of killing off Dr. Light and replacing him with a woman. Crisis gave him the excuse to more or less do that. Yay, the Crisis Tapes Return! I was really surprised and happy when this episode popped up in my iTunes queue! Unfortunately, I'll have to listen to it again as I was tired after coming home from work and feel asleep somewhere after you guys finished talking about page 2 or so. LOL! Anyway, thanks Murd and Peter for commenting on my comment about Supergirl. Yeah, I suppose she IS definitely more of a Superman family member than a Legion member. As for Batgirl and Supergirl meeting and talking or whatever, I fondly remember a couple of issues of World's Finest where (though they certainly were in the backseat compared to Superman or Batman) they seemed to know each other fairly well. Off the top of my head, World's Finest #176 (August 1968) pops into mind. Drawn by Neal Adams! How well they knew each other may be an assumption on my part. Probably when I was a kid, I thought all the super heroes knew each other! Thank you for another great Crisis Tapes episode. Really enjoyed it. Because of the way I listen to these longer episodes (broken up, over the course of a few days), I rarely find myself with much specific to say. But it always gets me thinking I need to go back and re-read Crisis again (even though I did re-read it earlier this year). That (little bit) said, when you were discussing the spectation (great word, Murd!) 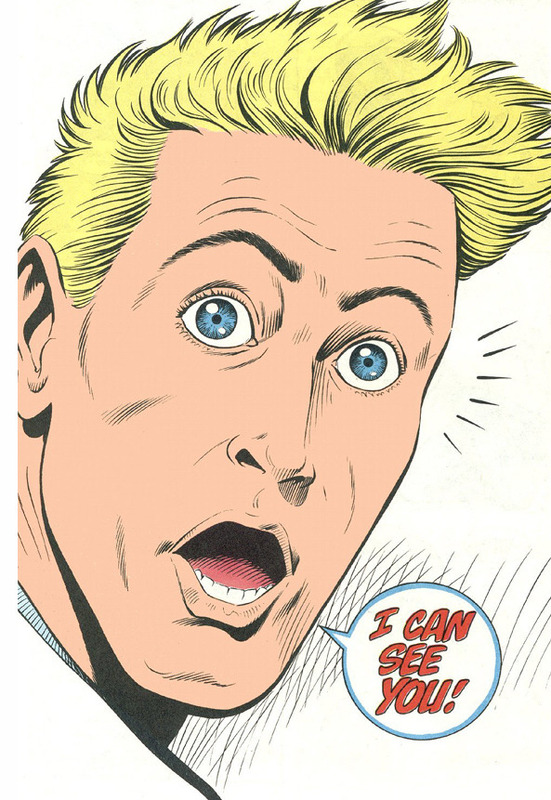 on the page where Alexander Luthor was watching Harbinger was watching the Monitor, et al, I immediately thought of the image below, since I did just finish re-reading Grant Morrison's Animal Man run. Looking forward to the rest of issue #4. Thanks again, Peter & Adam. Hope you are well! I am writing you to convey my deep appreciation for your work here at Comic Geek Speak. C.G.S. was the first comic book podcast I discovered and continues to be my favorite every year. I am twenty eight years old and as such was primarily a Marvel kid throughout the 1990's. I stopped keeping up with comics for many years and fell in love with the creation of sound (SFX) and music. Around 2014, just as I got hired as an audio engineer, sound designer and composer at a humble studio here in Las Vegas, I wrecked my motor scooter (lame I know...) rupturing my spleen and shattering my right leg. Never would have happened if my scooter had been a Legion flight ring... I was just starting to hit the comic shop every Wednesday to see what titles were in my small pull box. Needless to say once I was immobilized after the accident, my pull box grew larger than The Spectre serving vengeance. All I could do was read so I went to town! I was mostly reading Marvel and indie comics but I decided to give Convergence a shot. Though I know many hated it, I dug it! I bought every tie-in because it all seemed like fun. I am the exact audience DC marketed this event for. It sparked my interest in their publication history as well as their characters past and present. Shortly after Convergence ended, I was at the comic store leaning on my crutches (or maybe I was on a cane at that point...) when on the back wall i saw a collection of something called Crisis on Infinite Earths. I regret to tell you, that I did not purchase it. I left the store but I couldn't stop thinking about the cover of the first issue, it being a 1980's comic (which I was slowly becoming a fan of), and the brief synopsis the clerk gave me. I was still only reading a few DC titles at that time and didn't know a whole hell of a lot about the DC universe or multiverse. Imagine my joy when I discovered THE CRISIS TAPES and your thesis. I soon went back to the shop and though they had sold the collection on the wall, I managed to piece my own collection together in their back-issue bins. After I read the first issue I went page by page with you and Peter on the podcast and printed out your thesis. You and Peter are the perfect team up! Crisis was a gold mine of characters I had never heard of and I kept digging through my local shops and on the internet for more. I am now completely healed, still working at the studio and a huge fan of DC comics. I have many collections from the 1980's (my favorite era) and almost every single Crisis on Infinite Earths trade paperback, hardcover and tie-in including the INDEX! It has been an amazing journey for me to have been forced by my injury to slow down and dig into fiction previously unexplored. It has inspired me to read many genres of comics and novels over the years that I would otherwise never have thought to try. I have a second copy of Crisis issue #1 that I got signed by George Perez and will eventually have Marv Wolfman sign too (work in progress). I would be honored if I could mail it to you so that you and Peter could sign it before I frame it. To me, the two of you are as important to that book as anyone else who worked on it. I live in Vegas now but am from New Jersey so whether you ever end up out here or I go back east to visit family, the first round is on me! To me, the two of you are as important to that book as anyone else who worked on it. James, I could not agree with you more! Adam and Peter, and the entire CGS crew, have no idea how important they are to us...their fans. (Perhaps that's one of the reasons that they are so special?) I think that it's wonderful when we try to persuade them that they are valued more than they imagine, or even more than they can imagine. Thank you for your post, James. I know just how you feel. Hear, hear!! Thank you for initiating this, bralinator!! A “liana” is not a taxonomic name; it’s a description of the way a plant grows (i.e., as an epiphytic, usually parasitic, creeper vine, as Adam said). Lianas are plants that are rooted in the soil and then use trees (and other structures) for vertical support (think “wild grapes”). The term is no more specific than “tree.” It’s simply a description of the way that the plant grows. Hence, there are lianas in many plant families (at least two dozen), and this growth strategy is used at most latitudes on most continents (not simply by one species in tropical South America). No doubt on all that. But the larger point was how Crisis sometimes gets blamed for being a shill for other DC books. And yet we're 4 issues in and it's not blatant at all (yet?). This issue had no editor footnotes and yet the three sequences we brought up (Constantine, Shining Knight, Wonder Woman) could thematically connect to other titles in that same general release, and yet do it in a way events should do it: pique curiosity. You don't need those other titles, it's just a tour around the DCU. Clearly Wolfman was informed about what was going on in those other books so that he could use that status quo for his story. And since the entire event takes place in DC's "future" at that time, it makes sense that the companion titles around issue 4 aren't touching on the story just yet. A device that is going on in Doomsday Clock right now. We'll get honest "go read this" editor footnotes soon enough, but for the first arc, it's been relatively organic. As for Batgirl and Supergirl meeting and talking or whatever, I fondly remember a couple of issues of World's Finest where (though they certainly were in the backseat compared to Superman or Batman) they seemed to know each other fairly well. Off the top of my head, World's Finest #176 (August 1968) pops into mind. Drawn by Neal Adams! How well they knew each other may be an assumption on my part. Probably when I was a kid, I thought all the super heroes knew each other! It's odd to me that I barely read ANY Batgirl stories pre-Crisis. To me, she's Barbara Gordon first, Oracle second, Batgirl third. I was reading Supergirl in the early 80s, but the only "Batgirl" comic I read was a Detective Comics story where she was Barbara Gordon. I have a second copy of Crisis issue #1 that I got signed by George Perez and will eventually have Marv Wolfman sign too (work in progress). I would be honored if I could mail it to you so that you and Peter could sign it before I frame it. To me, the two of you are as important to that book as anyone else who worked on it. James! High praise indeed! Has Adam responded to this in an email yet? I'll agree that Marv was trying to be as organic about it as possible. His goal going in was to include in some way every DC character, which was a big part of the draw for George when he was asked to draw the book, and his purpose wasn't to necessarily shill for specific DC series, but rather DC the company, as you say, to pique readers' curiosity. Marv has always been one who does his homework, and that allowed him to craft a more organic story. But I also believe that we would have seen editor's notes in issue #1 if other writers had immediately gotten on board with what Marv was doing while Crisis was still in the development stage, as Marv was hoping would be the case. That's not to say you can't have organic writing (though with a cast this large, you can only be so organic in your approach) while promoting other books. I don't see it as an either/or proposition, though I do recognize that editors' notes and the like can call into question a writer's intentions. So I think what we're seeing in these first few issues is merely Marv the writer's intentions shining through, with Marv the editor's intentions taking a slightly less active role. Not yet! No rush! I know you guys are busy working on The Crisis Tapes!